Saf Davidson spins a lot of plates. She's a writer and narrative designer with a wide portfolio that covers game writing, reviews, prose, and criticism. She's also the chair of the New Zealand chapter of the Independent Game Development Association (IGDA), a regular podcaster, and often appears on panels and gives talks at industry events. It's fair to say that she sees the game industry from all sides. Saf is one of the people working on Loverwatch, an dating sim fan-game for Overwatch that spawned out of #ilujam. 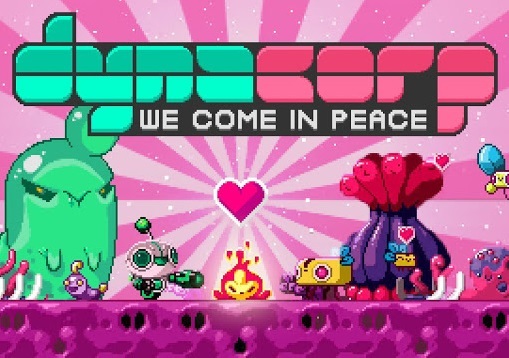 She's also doing some narrative work for Dynacorp, and adorable-looking platformer being developed by Rox Flame. For Saf, the most exciting (and still under-explored) things about video games is their storytelling capacity. Matt Codd (MC): What are you working on at the moment, and how's it going? Saf Davidson (SD): I'm currently doing some contract narrative work for Dinosaur Polo Club on a narrative puzzle game about relationships and family trees. It was one of the recipients of the New Zealand Film Commission's Interactive Development Fund. I'm really excited about the project, because it's quite different from anything else I've done, and the DPC team are some of the best people I've ever worked with. I'm also going to be doing some more writing on another Fund recipient, Dynacorp, which I did some work on last year. It's a really fun game to write for because it lets me lean a little bit more into surreal comedy. Plus, the aliens I get to write about are the cutest little things. MC: What do you think about the state of the New Zealand game development industry at the moment? SD: I think we're in a really exciting place at the moment. We've got a lot of talented and passionate people who want to see our industry succeed. There's definitely a lot of work that still needs to go into it, but I think we've got people willing to put in that work. I'm really excited to see where we go over the next couple years. MC: What recent game would you recommend to people at the moment, and why? SD: Probably Tacoma, or maybe What Remains of Edith Finch. Tacoma resonated with me so much, and it communicates its story in a different way that works so well. Plus, who doesn't love space? Edith Finch is a must play if you're excited about game narrative, because it really experiments and hits some wonderful notes. MC: What's something you love about the general games industry at the moment, and what's something you wish would change? SD: Something I love at the moment is the people. I've met so many amazing people in this industry over the last few years, and learned a lot from all of them. Something I want to see change is the way story and narrative are perceived in the general industry. As a narrative person, I'm always a little sick of the idea of "game over story", when I think that the games industry should embrace the unique capacity for storytelling that games have as a medium. So, that's something I'm hoping for. SD: I used to be really into Vocaloids when I was in high school, so yes.